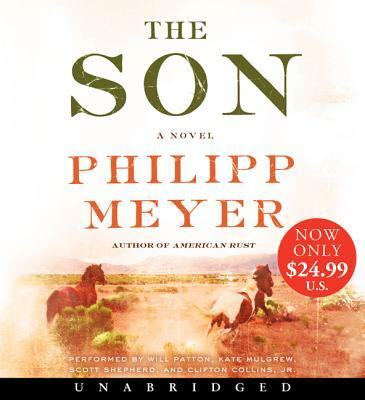 All of the (rave) reviews you will read about The Son will call it a "western" and make comparisons to the works of Larry McMurtry and Cormac McCarthy. These comparisons are right, but The Son is also much more than that; it is nothing less than a micro-history of the settlement of the North American continent, as told through the bloody, rapacious story of five generations of one Texas family. Beginning with the butchering of patriarch Eli McCullough's family by Comanches in 1849, and ending with oil Baroness Jeanne Anne's story in 2012, we follow the family as it grows in wealth and power, sometimes honestly, but more usually not. There aren't many 576 page novels that you wish were longer, but as I neared the end of this epic tome, I began to grow nostalgic for it even as the remaining pages were counting down. The Son is a great book. The critically acclaimed, New York Times bestselling epic, a saga of land, blood, and power that follows the rise of one unforgettable Texas family from the Comanche raids of the 1800s to the oil booms of the 20th century. Eli McCullough is just twelve-years-old when a marauding band of Comanche storm his Texas homestead and brutally murder his mother and sister, taking him as a captive. Despite their torture and cruelty, Eli--against all odds—adapts to life with the Comanche, learning their ways, their language, taking on a new name, finding a place as the adopted son of the chief of the band, and fighting their wars against not only other Indians, but white men, too-complicating his sense of loyalty, his promised vengeance, and his very understanding of self. But when disease, starvation, and westward expansion finally decimate the Comanche, Eli is left alone in a world in which he belongs nowhere, neither white nor Indian, civilized or fully wild. Kate Mulgrew, a native of Dubuque, Iowa, is an actress and author with an extensive career on stage and screen. From her start as Mary Ryan, the lead role on the popular soap opera Ryan's Hope to the groundbreaking first female starship captain on Star Trek: Voyager to her acclaimed performance as Galina "Red" Reznikov on Netflix's smash hit Orange Is The New Black, Kate brings a formidable presence and deep passion to all her projects. Her 2016 book, Born With Teeth, allowed her to add "New York Times bestselling author" to her resume.